Blackfish, the acclaimed documentary about captive Orca and the SeaWorld controversy will have a benefit screening for the Orca Research Trust shortly. 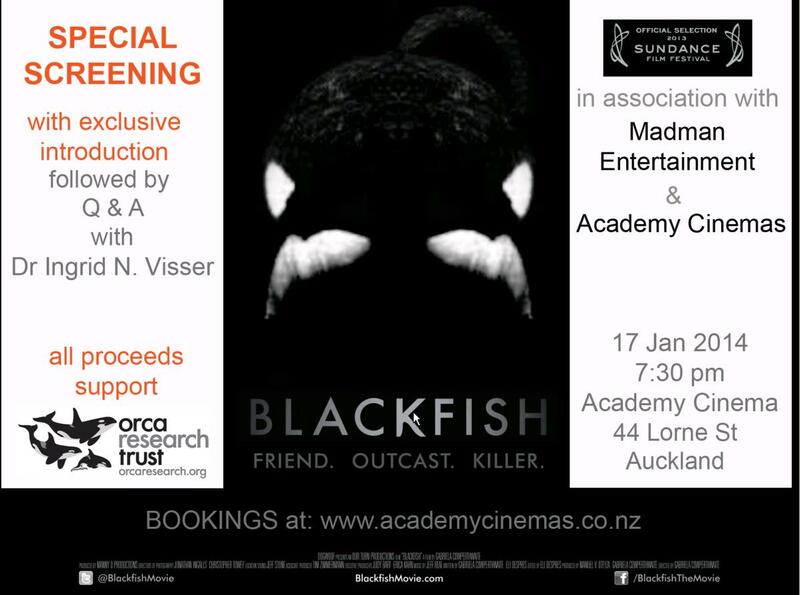 The screening will be in Auckland, 17 Jan 2014 - 7:30 pm (in association with Madman Entertainment and Academy Cinemas). The documentary not only features underwater wild orca from New Zealand but challenges us to consider our relationship to nature and reveals how little we humans have learned from these highly intelligent and sentient animals. BLACKFISH has been highly acclaimed (and short listed for an Academy Award). Renowned ocra researcher Ingrid Visser will do an introduction and after the documentary there will be a Q & A session. There will be door prizes, raffles and all proceeds from these and ticket sales will go towards supporting the Orca Research Trust.